Archives : RIL - RNRL SAGA DOMINATES THE WEEK - 19/06/2009. RIL-RNRL SAGA DOMINATES THE WEEK - 19/06/2009. Last week we had mentioned that the market was looking tired as it had rallied non-stop from the low of 8047-15600 without any correction. But our view was that this time the market may correct somewhat by breaking the support at 14500 before it rises further. The market broke the support as weakness set in due to the High Court verdict being unfavorable to RIL and the market broke the support at 14500. It went to a low of 14179 before staging a dramatic recovery on Friday, which sets up for an interesting tussle between the Bulls and the Bears in the coming week. EXPECT MORE TWISTS & TURNS IN RIL-RNRL SAGA. IMPORTANT: It has been noted that the Weekly Journal “Informed Investor” has been trying to tarnish my reputation for their own selfish motives. If any one has any grievance with me or my assocites, please feel free to contact me and get it solved. Appropriate action will be taken against those trying to tarnish my image and reputation. The share price of RNRL & RIL reacted strongly to the long awaited Bombay High court ruling. RNRL gained over 25%, while RIL dropped by around 8% after the verdict filtered in. The Bombay High court has ordered RIL to supply gas from its KG basin to RNRL for $2.34/mmbtu and not $4.2/mmbtu. The verdict gives a shot in the arm to RNRL. The judgment on the face of it looks unfavorable to RIL, but there will be many twists and turns to this story in time to come before the story concludes. The probability of the judgment being implemented in full does not appear very high. RIL is already on the way to Supreme Court and the judgment is slightly ambiguous as it has left the doors open to a settlement between the two brothers presided over by their mother.One important point according to the family settlement is RNRL cannot trade the gas that it gets from KG basin and it has to use it for power generations by its own group companies. The Dadri project is still on the drawing board and so RNRL will not be in a position to consume the gas for another 3 years. Another important point is that the government has made a list of priority sectors for the gas consumption where Fertilizer ranks at the top and power is lower in the list. Thus, RIL can use this and can sell most of its gas to Fertilizer companies at a price of $4.2/mmbtu. So expect more twists and turns in this story just like a Bollywood pot boiler. For the first time in 3 decades the inflation turned negative as it came at -1.61% for the week ended June 6, 2009. Even though the inflation has come below zero the retail prices continue to rise or remain at higher level. The negative inflation is more of a statistical phenomenon and is largely due to the base effect. It certainly is not a case of deflation which occurs during recession or when demands for goods fall sharply as loss of income forces consumers to purchase less. In fact the prices of food on essential goods were up by 5.7% but the increase was offset by a sharp fall in fuel prices, as the government had sharply increased the fuel prices in June to cut losses of the Oil Marketing Companies. Sensex opened the week at 15195, made a high of 15261, made a low of 14479, and closed at 14521, thus registering a weekly loss of 716 points for the first time after 14 weeks. It is a very tricky situation as the Sensex has formed a Bearish Evening Star reversal pattern on the weekly charts. On the daily charts the Sensex managed a strong comeback from the low of 14179, which resulted in a white candle with slightly longer lower shadow. Thus the emergence of buying support on Friday cannot completely offset the negative bearishness of the Evening Star of the weekly charts. Sensex has broken the first intermittent bottom at 14526 and the chances are it may go down to test the unfilled gap between 13479-12219. The Sensex has rallied non-stop from 8047-15600 without any major correction. If we consider the correction of this entire rise, then the retracement levels are 12715-11823-10932. 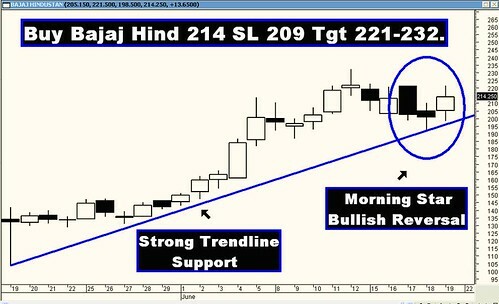 Last week the Sensex gave a Bearish Rising Wedge breakout and the target for which is 12940. This also coincides with the 50 DMA which is at 12998. Even the 38.2% retracement of the entire rise from 8047-15600 is at 12715. Thus there seems to be strong support existing between 12998-12715. The indicators are showing weakness as the momentum indicator ROC has given a Sell signal and is negative but is trying to move upwards. The RSI is at 52 and has taken support at 50, giving some hope to the long traders. The MACD which had given a sell signal last week continues with the sell signal but is still in the negative zone. Thus the indicators are suggesting a tricky picture favoring the Bears. The Trendline resistance for the Sensex is at 15427-15892 and the Trendline support is at 14095-13663. For the week ahead the Resistance is at 14677-14930-15257. Support is at 14179-13946-13518. Nifty opened the week at 4584, made a high of 4601, low of 4206, and closed at 4313. Thus the weekly loss was 270 points for the first time after 14 weeks. The Nifty too has formed conflicting candle stick patterns on the daily as well as weekly charts. On Friday, the Nifty has formed a Bullish Harami pattern on the daily charts, whereas on the weekly charts it has formed a Bearish Evening Doji Star reversal pattern. The Bearish weekly Evening star pattern will exert itself on the Nifty and will lead the Nifty to test lower support levels in the next week. Nifty has broken the first intermittent bottom of 4365 and is now probably on the way to test the level of 4092. The Nifty has rallied non-stop from 2539-4693 without any major correction. If we consider the correction of this entire rise, then the retracement levels are 3870-3616-3362. 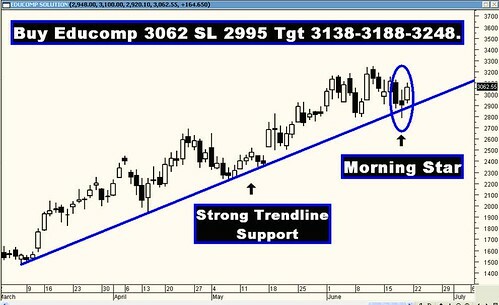 Last week the Nifty gave a Bearish Rising Wedge breakout and the target for which is 3931. This also coincides with the 50 DMA which is at 3950. Even the 38.2% retracement of the entire rise from 2539-4693 is at 3870. Thus there seems to be strong support existing between 3950-3870. The Nifty O.I.PCR is at a low of 0.82. It is on the way to getting oversold (generally it reverses from 0.65-0.70). The 4400 and 4500 Nifty strikes are seeing strong CALL writing and Nifty strike of 4200 is seeing strong PUT writing. Thus in the very short term the Nifty is likely to take support at 4200 and will find resistance in the zone between 4400 and 4500. The Trendline resistance for the Nifty is at 4607-4776 and Trendline support is at 4204-3972. For the week ahead, the Resistance is at 4365-4453-4509. Support is at 4092-3931-3790. Despite the turbulence in the last week our recommended pairs managed to put up a decent performance. Except one pair the other two pairs did exceptionally well. Construct a Bull Call Spread for ITC (200) is likely to reach 210. Buy 200 Call at 4.25 and Sell 210 Call at 1.75. Cost of constructing the Spread is Rs.2.5 (Rs. 5,625) which can be the max loss and the max profit will be Rs.7.5 (Rs.16,875).